Believe it or not, we’ve not seen the seemingly-inseparable comedic coupling of Simon Pegg and Nick Frost on screen together since 2013’s The World’s End. You’ve former Kula Shaker frontman Crispian Mills to thank for their first reunion since completing Edgar Wright’s Three Flavours Cornetto Trilogy, as Pegg and Frost are amongst the cast for the director’s boarding school-set horror Slaughterhouse Rulez. 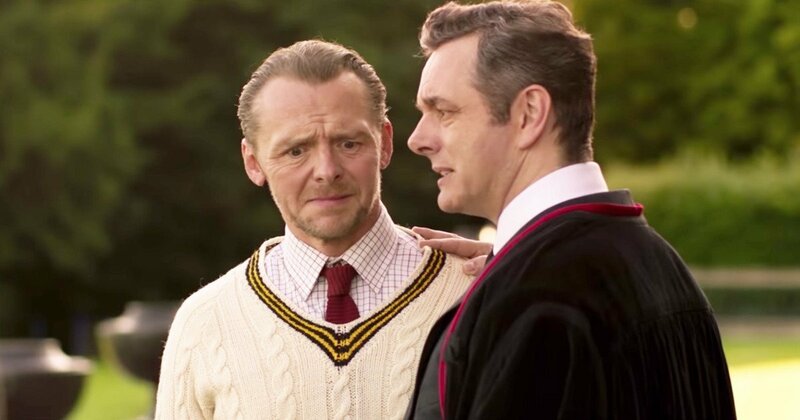 Also featured in the film’s first trailer, embedded below, are Michael Sheen as the school’s hideously plummy headmaster “The Bat” admonishing pupils — including Hugo‘s Asa Butterfield and Pegg’s Mission: Impossible – Rogue Nation co-star Hermione Corfield — for straying outside the school’s ground past lights out. It turns out he’s not only concerned about the kids straying into a nearby fracking location. There’s also the matter of what digging beneath the ground’s surface has unleashed. With a tone pitched somewhere between the pre-pubescent derring-do of The Goonies, the class satire of Lindsay Anderson’s If… and the genuine frights (and gore) of Gremlins, Slaughterhouse Rulez looks like it’ll be a bloody good time in all senses of the word. has focused increasingly on his screen work. He made his feature directing debut with 2012’s A Fantastic Fear of Everything, also starring Pegg, a peculiar black comedy about a children’s author who becomes obsessed with death, adapted from a book by Whitnail & I‘s Bruce Robinson. Written by Mills alongside Henry Fitzherbert, Slaughterhouse Rulez also stars Finn Cole (Peaky Blinders), Jo Hartley (Eddie the Eagle), and If I Stay‘s Jamie Blackley. It’s the first feature to be produced by Stolen Picture, a film and TV production company formed by Pegg and Frost. Slaughterhouse Rulez is due for release on 31 October 2018.